Get an early look at the hottest new toys in 2017. 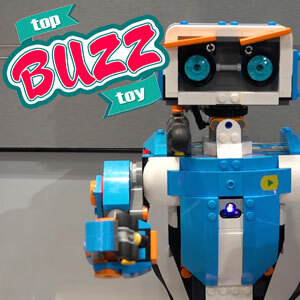 We hand out our “Buzz Toy” awards for Toy Fair 2017. 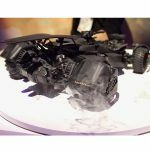 After getting an exclusive sneak peek at literally thousands of the newest Toy of the Year hopefuls showcased at the 2017 New York Toy Fair and much deliberation among our toy experts at Toy Buzz, we highlight some of the best, hottest, and downright coolest toys to look forward to in 2017. It was like a trip to Santa’s Workshop. 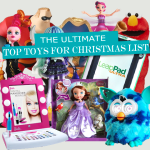 These must-have toys are sure to be among some of the top toys on children’s Christmas wish lists that they’ll be begging parents for this Christmas. These hot toys have been categorized based on this year’s toy trends that have been identified by the Toy Industry Association. 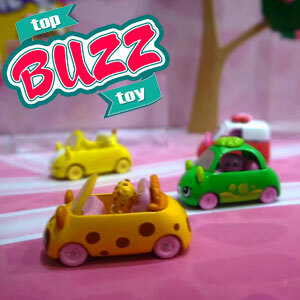 Among the list of top toys, Toy Buzz has identified “Buzz Toys”. 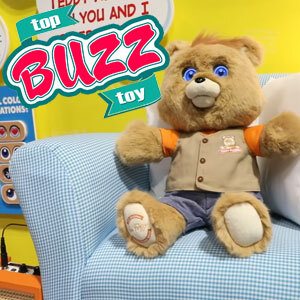 A “Buzz Toy” is a toy that is expected to be one of the most buzzed about toys later this year. 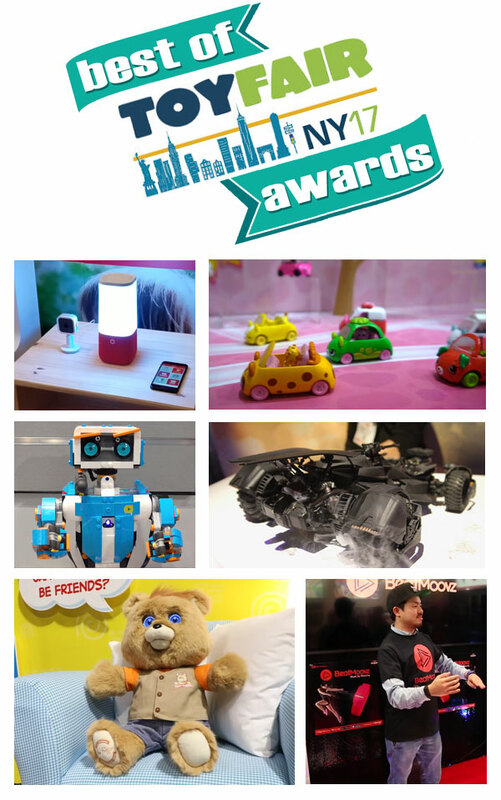 We have selected our overall toy of the show as well the “Buzz Toy” each category. 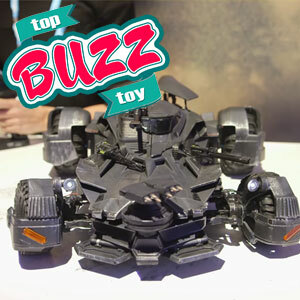 What is the newest toy that made the biggest splash at Toy Fair 2017 straight to the top of your most wanted list? He’s back! Kids’ favorite iconic story-telling bear returns from the 80s with a high-tech makeover from Wicked Cool Toys. Thanks to today’s technology, he no longer uses the big bulky cassette player. He’s been reimagined for a whole new generation of kids and he will bring back nostalgia to many parents who played with him as a child over 30 years ago. It ultimately gives parents a shared experience that they can now share with their kids. 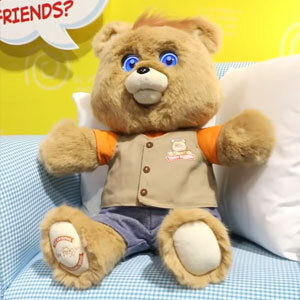 Teddy Ruxpin now features animated LCD eyes that convey emotion like never before and touch sensors in his paws. Teddy sounds the same as when he originally debuted in 1985 and he’s cuddlier than ever. Stories are now saved digitally rather than on cassettes and kids can read along with an app. Three stories are included with the story-telling bear and additional stories can be purchased separately. Story time will never be the same! Teddy Ruxpin will retail for $100 and arrive on store shelves this July 2017. Shopkins are the hottest collectible toys on the market and there’s practically nothing that can stop them. The Shopkins craze is about to get out of control. 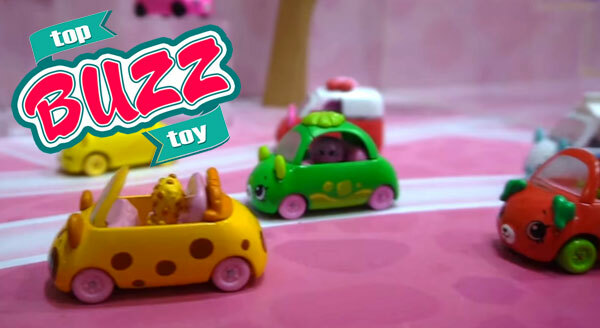 Moose Toys announced new Shopkins Cutie Cars to the toy line. 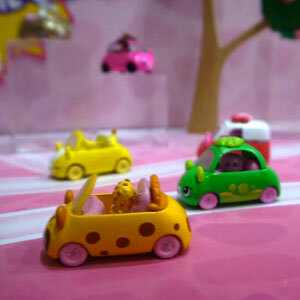 These will be limited edition fashion Cutie Cars. They are so tiny, adorable, and colorful with a variety of awesome designs. They will debut this Fall 2017 and each car will sell for $4.99. 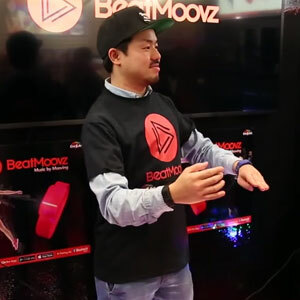 BeatMoovz is a cool and hip new music tool for kids and teens. Simply place the device on your wrists and ankle and start moving and groovin’ to create all sorts of beats and sounds. Your dance moves are magically converted into music. It’s fun and a fantastic way to get kids up and active. The set includes two wristbands and will be available in August for $59.99. Mattel’s Aristotle by Nabi is a new personal assistant that is similar to Amazon Echo and Google Home. 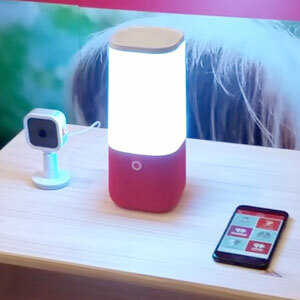 It’s a voice-controlled smart baby monitor and grows with your child from the time they are born to high school. It is so much more than just a baby monitor. One cool feature is that if Aristotle detects your baby crying, it will begin playing a lullaby. Aristotle retails for $299 and it will release in June 2017. Kids’ favorite iconic story-telling bear returns from the 80s with a high-tech makeover from Wicked Cool Toys. He’s been reimagined for a whole new generation of kids and he will bring back nostalgia to many parents who played with him as a child over 30 years ago. Now he no longer uses cassettes. Teddy Ruxpin now features animated LCD eyes that convey emotion like never before and touch sensors in his paws. Teddy Ruxpin will retail for $100 and arrive on store shelves this July 2017. 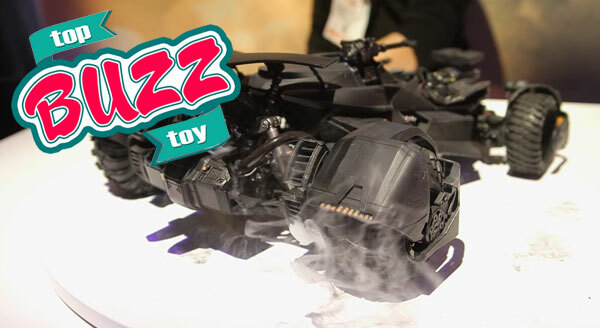 By far this was one of the coolest new toys on display at Toy Fair. 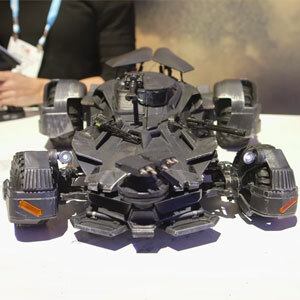 It looks incredibly detailed, features a cockpit and a mode allowing fans to step into the vehicle and see through the eyes of Batman. But the best part is that it oozes real smoke when you rev the engine, using sugar-based oils. This is a fantastic collector’s edition for die-hard Batman fans. The Batmobile won’t come cheap – it comes in at $250. LEGO Boost was built for a younger audience (7+) to learn introductory coding principles. Kids will build, code, and play. They can build one of five different models. Coding allows kids to assign behaviors to their model. The focus is on having fun by tinkering around and not necessarily on the coding. This innovative block set will release this August. Collectibles include both basic and inexpensive collectibles. These include collectibles with several play functions and higher priced licensed collectibles. Collectible toys develop life-long skills, such as social skills, organization skills, and perseverance. Hatchimals Colleggtibles extend the hatching toy craze with a brand new collectible toy line. This new collectible Hatchimals set features mini-sized eggs with various animals ready to hatch. The first season of this collection features over 70 collectibles in all. These collectibles will be sold in blind bags for $2.99 each or in 2-packs for $4.99. 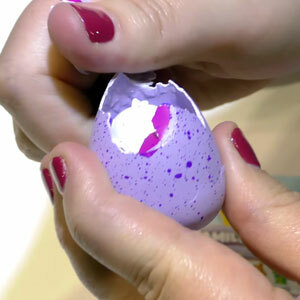 Hatchimals Colleggtibles hatch this Spring. At this year’s Toy Fair, an increasing number of toys encourage kids to get up off the couch and get active. Kids will be burning off calories and getting in shape all while having fun. This trend includes tech toys with active features, outdoor ride-ons, traditional games that promote physical activity, and digital toys with face-to-face play. 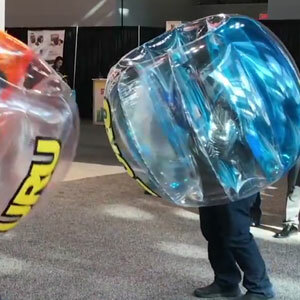 Zuru’s latest creation allows players to get in a transparent inflatable bubble and bump and bash into your play friends for all out incredible fun! It takes contact sports to the extreme and you can withstand tremendous impacts in the backyard or outdoors. It’s simple yet incredibly fun and players have to try and knock down their opponent. The X-Shot Bubble Ball is designed for kids ages 8 and up and will retail for $59.99. Thumb Chucks is a cool new spinning skill toy from Zing. The experience is similar to using nunchucks. The set includes 2 LED balls connected by a string. You can perform over 30 different tricks and videos on how to perform cool moves are posted throughout social media, including YouTube. The balls can be popped off for customization. Thumb Chucks is designed for ages 5 and up. 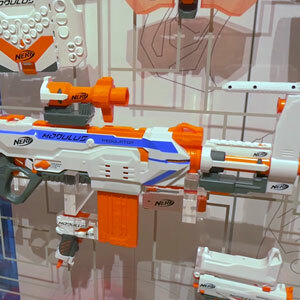 The Modulus is one of the most exciting new Nerf guns because it’s fully customizable with several cool accessories. It features an innovative select fire circuit built-in. 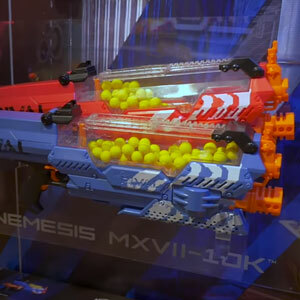 It’s also the first burst-fire module from a blaster in the primary class of blasters. Users can select from single-fire a or 3-round burst with switch-fire technology. It’s a combination of really great tech and it’s ergonomic, intuitive and works exactly like Nerf fans would expect! Designed for the older crowd – ages 14+ – the Nemesis delivers more intense battling and head-to-head team-based competition. It’s motorized and holds up to 100 rounds and fires up to 70 mph! 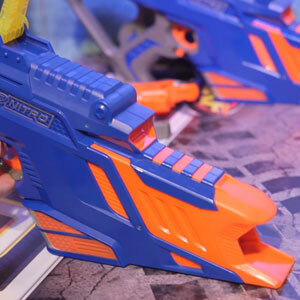 It’s also the first time Nerf has implemented a hopper-based system in one of its blasters. This blaster releases Fall 2017 and will retail for $100. New for 2017 from Razor is the RazorX Cruiser. This is an electric-powered skateboard with high performance for under $200. It appears to be a normal skateboard at first glance but hidden underneath is a housing unit and motor that power the rear wheels. 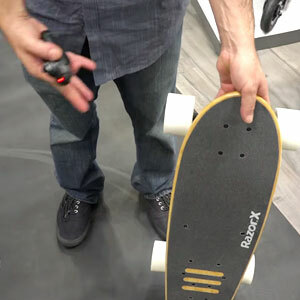 Riders can use a remote control to control the board. Unlike other electrical skateboards, this one has a soft start. Look for the RazorX this summer 2017 for $179.99. This mini stationary, connected bike will make learning and exercising fun for kids. It connects to the TV or tablets via Bluetooth and features learning apps/games centered on math, science, literacy, social studies, STEM, and more. More apps are planned for future release. 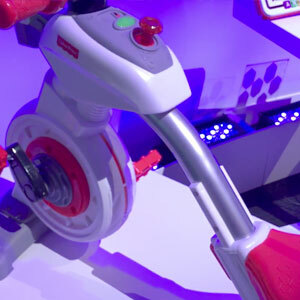 Essentially, it’s a stationary bike that kids can use to exercise on and play education videogames by pedaling through the various levels. The Smart Cycle will retail for $150 and will debut in Fall 2017. 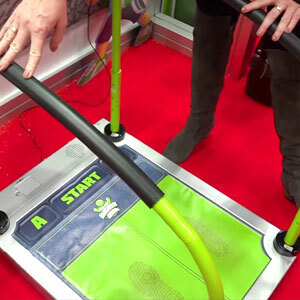 This new gym from Jakks Pacific meshes the physical and digital worlds. Kids play a variety of fun, interactive games, including track and field and zombie dash, by running and jumping on the exercise pad. You’ll need a mobile device or tablet to run the app. It’s a great way for kids to get physical activity while having fun. The Teach ‘n Tag Movi is a brand new toy unveiled at Toy Fair from Fisher-Price. It’s geared for children ages 3 and older and encourages kids to get up and moving, which is a great thing and one of the new toy trends for 2017. Movi looks like a cute robot on wheels with a lighted face. It develops important listening skills and the ability to follow directions. Teach ‘n Tag Movi will debut on store shelves this Fall 2017 for $49.99. This electric go-kart delivers and incredible sense of immersion and realism and is designed for 5-9 year olds with top speeds up to 12mph. A cool feature is that it has collision avoidance tech to detect and avoid obstacles. A companion app allows parents to set speed limits and specific riding area. It also features GPS and Wi-Fi. This Smart-Kart runs circles around Power Wheels. 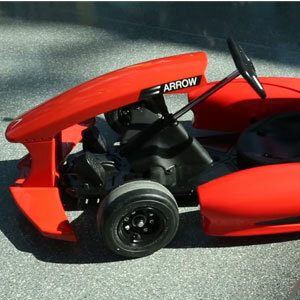 The Arrow Smart-Kart sells for $1000 and ships this Spring 2017. 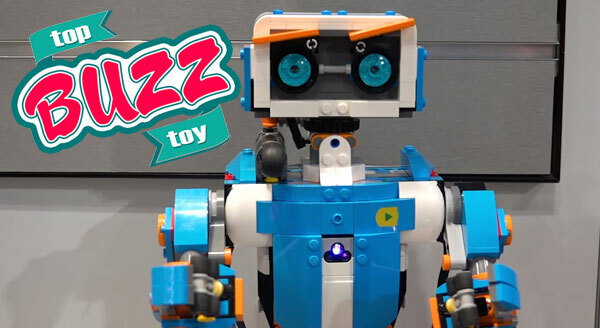 Toy companies are introducing tech features into many of their toys. With tech becoming more affordable and driving more realistic prices for the consumer, we’ll continue to see augmented and virtual reality toys, drones, virtual pets, robotics, and more. Toy manufacturers are harnessing technology to enhance traditional play patterns. Mattel’s Aristotle by Nabi is a new personal assistant and more. It’s similar to Amazon Echo and Google Home. It’s a voice-controlled smart baby monitor and grows with your child from the time they are born to high school. 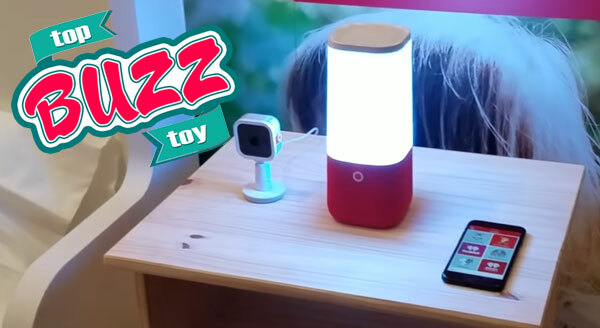 It actually packs 5 devices in one – baby monitor (watch), smart light (mood), Bluetooth speaker (listen), Wi-Fi HD Camera (monitor), and sound machine (sleep). The video and audio stream to your smartphone so you can keep an eye on baby. One cool feature is that if Aristotle detects your baby crying, it will begin playing a lullaby. If parents purchased these products separately you would easily spend over $800. Aristotle offers all of this functionality in one convenient all-in-one package for $299 and it will release in June 2017. Barbie has stepped into the 21st century with a Barbie from the future. 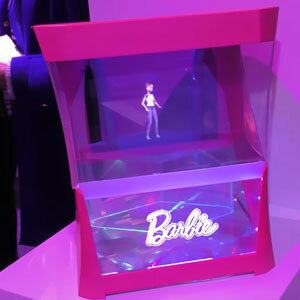 Hello Barbie Hologram is a personal assistant and she’s a virtual interactive holographic Barbie perfect for your girl’s nightstand. You’ve never seen a Barbie like this before! Hologram Barbie features life-like motion animation and she can perform dances, tell girls the weather, act as a nightlight and alarm, and can even advise your child to brush her teeth! It’s like a tiny virtual friend for girls. There will also be a variety of Barbies to choose from. 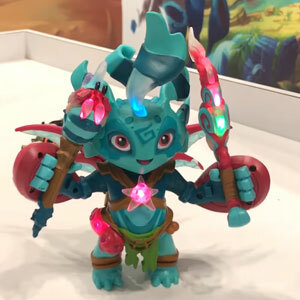 Lightseekers brings innovation to the toys-to-life segment of videogames and evolves to what is known as connected play. It features intriguing, large 7-inch articulated figures that speak, vibrate, and evolve. You use these toy action figures to play a mobile action-adventure role-playing game by physically moving the action figure around in the real world. The Lightseekers will launch in July 2017. 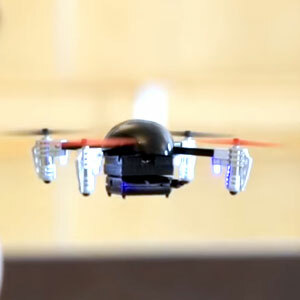 This third generation mini drone features an HD camera that is gimble-stabilized. The included headset allows users to experience the action in first-person mode. Employing augmented reality (AR) and goggles, the Holo Cube allows kids to experience holograms. Kids can hold and interact with various objects from musical instruments to virtual pets. 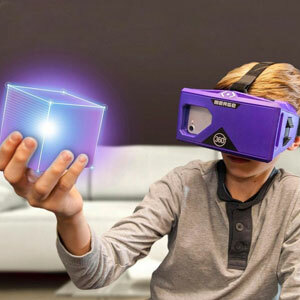 Using the Holo Cube with VR Goggles allows kids to interact with the holograms. The toy offers innovative ways for kids to learn, play, and connect with others. Imagination and creativity are brought to life in unimaginable ways with new, cutting-edge technology. 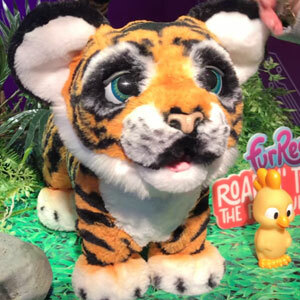 The Playful Tiger Pet – Roarin’ Tyler is the newest addition to the FurReal Friends line of interactive pet toys. Kids can now bring home this cute, friendly, and playful pet tiger and take care of him as their own. Roarin’ Tyler features over 100 sounds and sensor actions that bring him to life. Kids will be inspired to dream up incredible adventures with their new pet tiger. This FurReal Friend will be available this Fall 2017 for $129.99. It is recommended for kids ages 4 and older. After the toy craze last year, the Hatchimals are back in action. 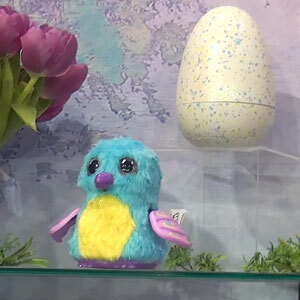 The new Hatchimals Glitter version of the hatching toys will feature a new sparkly finish for both the creature and the egg. The new Hatchimals will feature brand new songs, sounds, and games to entertain kids. The new version will release this summer for $59.99. Luvabella was one of the hottest new interactive dolls from SpinMaster because of its incredible sense of realism and advanced animatronics technology. She features arm, eye, and even mouth movements that make it seem so life-like. Luvabella loves being tickled and is a very happy baby. Luvabella will be available in three models: blonde, brunette, and African American. LuvaBella, the real baby doll, will release in August 2017 for $99.99. 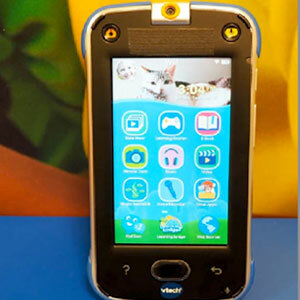 VTech’s Android-based kids tablet will feature a kid-friendly messaging system called KidiCom, allowing kids to send text, photos, drawings and more to family and friends. It has a kid-friendly design with bumpers and a shatter-proof screen. It will feature 40 built-in learning apps and kids will be able to learn math, spelling, music, and more. It even features a kid-safe web browser with parental controls so kids can safely surf the web. 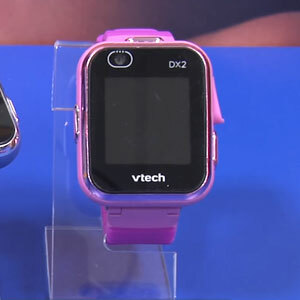 VTech’s released its second iteration of the smart watch for kids called the DX2. It’s like an Apple Watch or Fitbit for kids and kids will be able to play games and engage in various challenges. Play-Doh Touch is a shape-to-life studio. It’s the first digitally integrated experience for the Play-Doh brand. 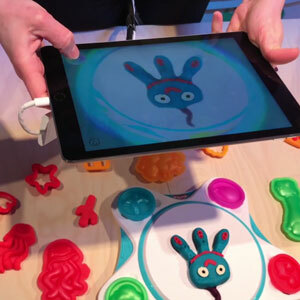 After making your creation, you scan it with your tablet and it morphs into your Play-Doh digital world. Then you can play with your digital creation in a fun play world. The toy encourages you to engage in both physical and digital forms and develops problem-solving skills. 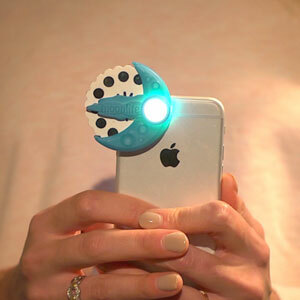 Moonlite is a small accessory for your smartphone that allows parents to project bedtime stories. It’s a bedtime story projector for your mobile phone. Classic toys will continue to deliver strong performance after strong sales in this category last year. Game/Puzzles and dolls were among the fastest growing toy categories in 2016. This trend includes retro brands that are reimagined for a new generation of children. Classic toys appeal to families and foster intergenerational play. Kids’ favorite iconic story-telling bear returns from the 80s with a high-tech makeover from Wicked Cool Toys. He’s been reimagined for a whole new generation of kids and he will bring back nostalgia to many parents who played with him as a child over 30 years ago. It ultimately gives parents a shared experience that they can now share with their kids. 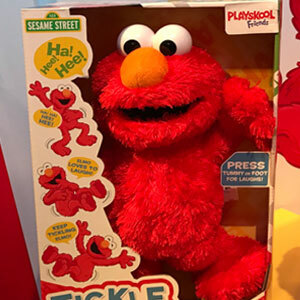 Tickle Me Elmo is back in 2017! This time around Playskool has brought Elmo to life instead of Tyco. He’s new and improved! First, he features new and improved tech. He no longer has those mechanical sounds and he’s lighter and softer than ever. Elmo is also smaller than the original Tickle Me Elmo. Remember, the toy craze from 1996?! We hope they’ll have enough this time around. 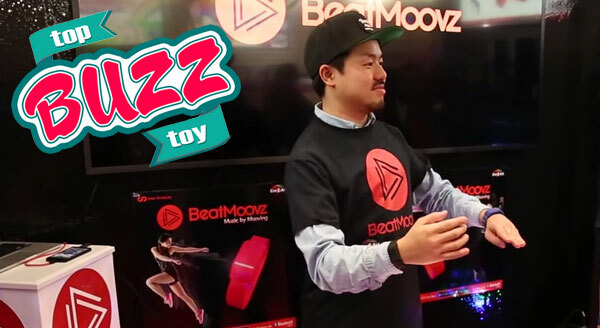 The toy will retail for $30, and it’s recommended for kids and toddlers ages 18 months – 4 years old. Nerf Nitro is an all-new line that combines the Nerf blasting experience with soft, foam cars for a brand new insane vehicle experience. It features incredibly thrilling stunts, jumps, and speed! There are no tracks here – it’s all about out of the box play. Perfect for Nerf fans who want to create their own stories and stunts and share it with their friends. 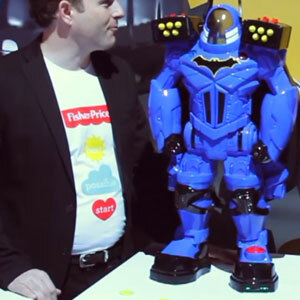 Fisher-Price’s ImagiNext BatBot Xtreme features a giant Batman mechanized suit that was one of the coolest new Batman toys. It’s gigantic (standing 28” tall) and a boy’s dream come true! It features flap-out wings and punching fists. There’s even a voice changer and you can launch missiles at adversaries. There is nothing that’s going to get in the way of the BatBot Xtreme! Ultimate Voltron is inspired by the Voltron show from the 80s. Playmates’ new deluxe robot action figure features lights, sounds, and over 25 points of articulation for the ultimate poseability. It’s a fantastic recreation of the robot from the show with plenty of detailing and a good paint job. 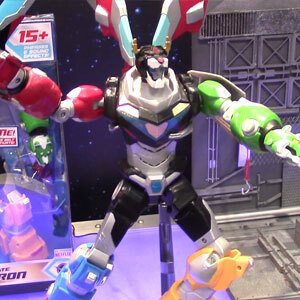 Voltron can stand on its own, and it can grab its sword and you can mount its wings, which are poseable. Ultimate Voltron will retail for $39.99. Trypticon is the largest Decepticon ever and the biggest action figure in this year’s Titans Return line. Trypticon can be transformed into 3 forms – a dino, spaceship, and city. Trypticon will debut on store shelves this Fall 2017 for $149.99. American Girl introduced its first boy doll in its history and he looks quite handsome. 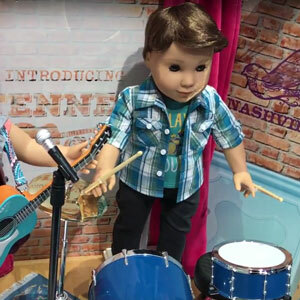 The new 18-inch boy doll’s name is Logan Everette and he’s a musician that comes with a drum kit. Logan Everett will be available on store shelves in February 2017. 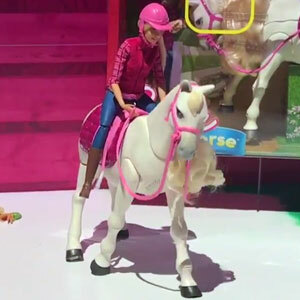 The next big thing in the world of Barbie is the Barbie Dream Horse. Barbie can ride the horse and it can walk and dance. It features cool horse sound effects, responds to touch, and responds to voice with voice-activation. The horse features the most premium hair seen on a toy horse. Girls will be able to name their Dream Horse since it hasn’t been given a name. The Barbie Dream Horse will retail for $99.99. 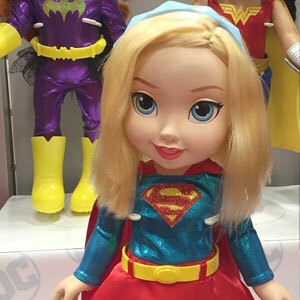 New 18-inch DC Super Hero Toddler Girls Dolls will be released in Fall 2017 from Jakks Pacific. The dolls in the collection include Super Girl, Batgirl, Harley Quinn, and Wonder Woman. These dolls look so cute and adorable and they feature super cool ‘Royal Reflection’ eyes and spectacular superhero costumes. 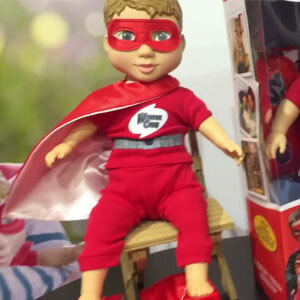 Play Monster’s the Wonder Crew Dolls are superhero action dolls inspired by boys. It’s like a mesh of action figures and stuffed animals. They are soft huggable buddies that boys will love taking along on adventures. The boy dolls include a matching mask and cape for your boy. They are great for promoting an emotional connection and creative, imaginative play. They teach boys social and emotional skills that boys have been missing. Hasbro’s newest fun, wacky game is called Toilet Trouble. Kids spin the toilet roll and flush the toilet the corresponding number of times. Players have to avoid being sprayed. If you’re the last player to avoid the toilet spray is declared the winner. Arrives Spring 2017 for $19.99. Suitable for kids ages 4 and older. Licensing has significantly boosted the toy business with roughly 30% of all U.S. toy sales. With the family-friendly movies set to release this year, 2017 is expected to continue this trend. Some of the family-friendly movies include LEGO Batman, LEGO Ninjago, Cars 3, Beauty & The Beast, Smurfs: The Lost Village. Other hit movies include Star Wars: The Last Jedi, Despicable Me 3, Spider-Man: Homecoming, My Little Pony: The Movie, Power Rangers, Guardians of the Galaxy 2, and Transformers: The Last Knight. Some are expecting this to be a big year for movies and movie-tie toys. You can expect licensed toys based on popular characters in ride-ons, plush, action figures, and puzzles. Spin Master brings everyone’s favorite droid from Star Wars to life with a new life-sized, voice-controlled, and radio-controlled version of BB-8. 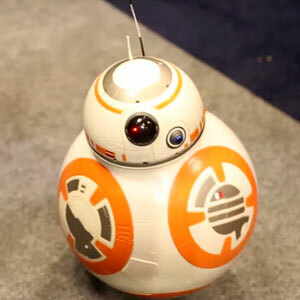 Fans control Hero Droid BB-8 with a remote controller and he reacts when called via voice command. He can even follow you around and he reacts to whoever is in the vicinity. Hero Droid BB-8 will retail for $229.99. Minion fans can bring home their very own Minion Dave based on the latest Despicable Me 3 movie. 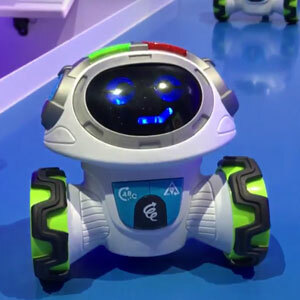 This new version from WowWee can move around your room via the Turbo Dave app. Fans can have him interact with other Minions and he even responds to gestures. There is also a coding component to this toy. Look for MiP Turbo Dave this Spring 2017 for $79.99. This toy is suitable for ages 8 and up. RC Sqweeks is based on the new Transformers: The Last Knight movie. 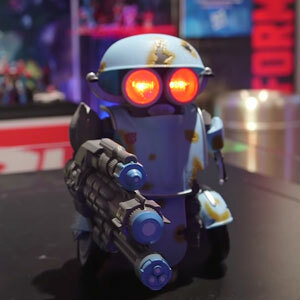 He is a radio-controlled robot has emotive eyes and engages in blaster battle. He also dances and makes sounds. 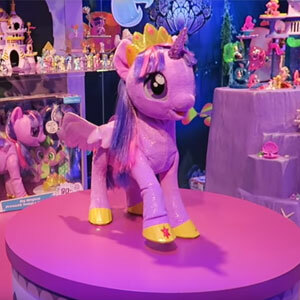 Hasbro brought Magical Twilight Sparkle to life like never before. 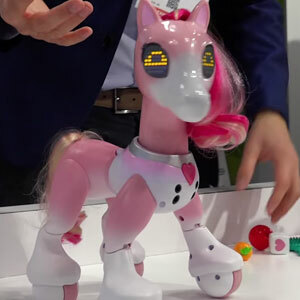 She is interactive with over 90 unique phrases and responds to touch and sound and is based on the new My Little Pony: The Movie. She features four modes: Story mode, Song mode, Friendship mode, and Magic mode. This magical pony features over an hour of engaging content for MLP fans. This is a new toy based on Star Wars: The Last Jedi. The helmet looks like something straight out of the film. The helmet feels comfortable with padding and a slick yellow visor. 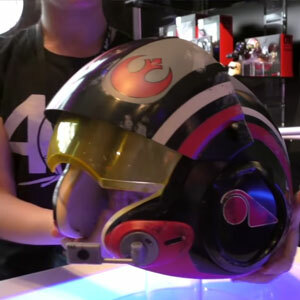 The helmet features surround sound effects, making it feel as if you’re in an X-Wing with BB-8. The helmet debuts this Fall 2017 for $80. 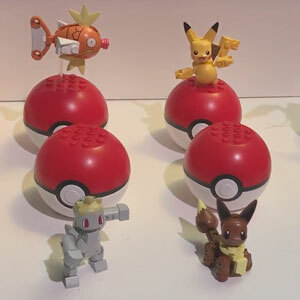 New Pokémon sets are set to be released this summer in the Mega Construx line. The sets look fantastic and fans just gotta catch ‘em all! The sets will feature articulation. This educational toy trend is here to stay and is not going away anytime soon. It teaches kids important concepts: Science, Technology, Engineering, Arts, and Math (STEAM). The educational trend will evolve to incorporate Robotics to create ‘STREAM’. Even classic toys teach important educational skills, such as problem-solving, critical thinking, and creativity. This category includes puzzles, memory games, building blocks, and stacking toys among others. 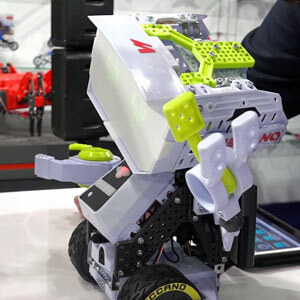 Hasbro has begun introducing STEM toys into its traditional toy lines. Dance Code Belle is tied-in with the new live action Beauty and the Beast movie and teaches girls the basics of coding. 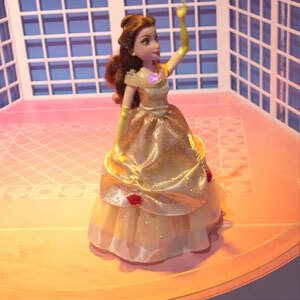 Belle talks and moves and girls will be able to code complete dance routines via a simple app with this dancing doll. It uses block coding concepts to make the doll dance. Dance Code Belle will retail for $120 and will be available in Fall 2017. 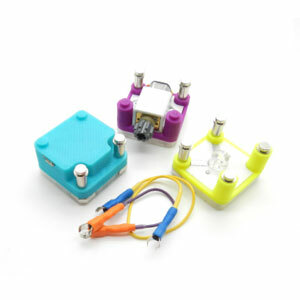 Circuit Cubes are building blocks that transform Legos and ordinary household objects into smart toys. The modules include a collection of battery blocks, switches, relays, and tools. 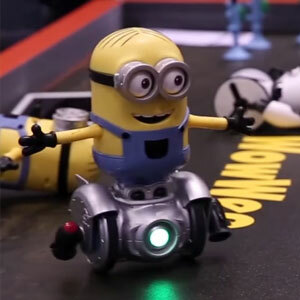 Kids can motorize toy cars, create flashlights or a create a noise-generating toy. Kids will even learn a little about circuitry. Tenka Labs will create instructional videos to create interesting objects like a swimming whale and more. 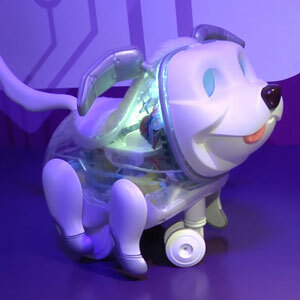 Proto Max is the latest animatronic robo-dog pet from Hasbro from the FurReal Friends Makers line. 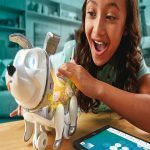 This cute robo-dog teaches kids ages 6 and older basic coding principles. Proto Max’s personality can be programmed with 400 sounds, 100 eye animations, and customizable routines. He’s quite charming and can perform tricks and spins. The depth of its customization shows great promise. Proto Max will hit store shelves this Fall 2017 and will retail for $120. 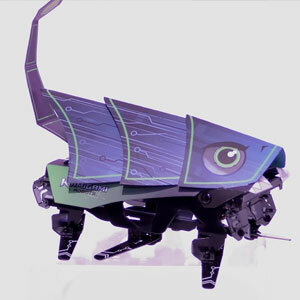 KamiGami are new DIY model kits from Mattel that combine the worlds of robotics with origami. The KamiGami robots can communicate with one another and kids can play with it via a free app. Kids ages 8 and older can also program their KamiGami robots with simple drag-and-drop programming. KamiGami releases Fall 2017 and will retail for $49.99. Meccano M.A.X. 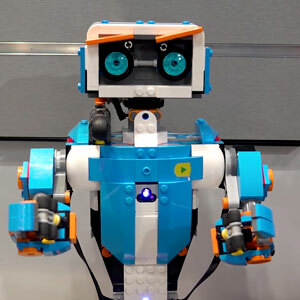 is a robotic toy kids can build and program with a companion app. M.A.X. communicates and learns information as you converse with him and he can even detect motion. He’ll say, “What was that?” and he’ll wait to hear your answer. 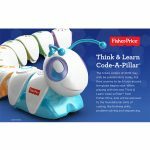 Primo Toys has created a new toy so even preschoolers can learn to code and get in on the coding action. Colorful blocks represent commands that a robot follows sequentially. 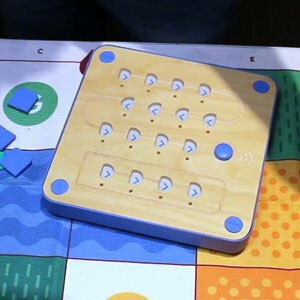 It’s child-focused for ages 3 and older and great for developing problem-solving skills. Cubetto will retail for $225. Who wouldn’t want to own their very own pony? With voice activated commands, Zoomer Show Pony reacts to both your touch and voice. You can do all sorts of stuff to take care of her including feeding her. The coolest part? Girls will love brushing her pony hair. Your Favorite New Toy of 2017? What is your favorite new toy of 2017? Let us know in the comments. Smart Cycle is THE best and most fun and beneficial activity toy yet! I saw the larger version that adults were demonstrating and it was amazing to see how beautiful the high resolution graphics were. Children will learn in virtual worlds-so cool!